Below, watch previews for Adult Swim‘s Mike Tyson Mysteries and for the Mr. Pickles TV series, returning April 17, beginning at 11:45pm. The second half of Mike Tyson Mysteries, season two, kicks off first. The voice cast of Mike Tyson’s Mysteries includes Mike Tyson, Norm Macdonald, Rachel Ramras, and Jim Rash. Sam Register executive produces. Hugh Davidson produces. Mr. Pickles’ second season premiere follows directly at midnight (April 18, 12:00am). The voice cast includes Kaitlyn Robrock, Jay Johnston, Brooke Shields, Frank Collision, Will Carsola, and Dave Stewart. A HotHouse production, Mr. Pickles is created and executive produced by Will Carsola and Dave Stewart and executive produced by Michael Rizzo. Mike Tyson, once the “baddest man on the planet”, remains hell bent on becoming the “goodest man on the planet”… one mystery at a time! The season two mysteries are even more banal than season one. Mike Tyson Mysteries stars Mike Tyson, Norm Macdonald (Saturday Night Live), Rachel Ramras (MAD) and Oscar(R) winner Jim Rash (The Way Way Back, Community), and is produced by Warner Bros. Animation. Sam Register (Teen Titans Go!, MAD, The Looney Tunes Show) serves as executive producer with Hugh Davidson (MAD, The Looney Tunes Show, Robot Chicken) as producer. Watch this “Mike Tyson Mysteries Season 2 Returns” preview from Adult Swim. Mr. Pickles, Old Town’s cutest dog is back for a second season of tail wagging, flesh ripping and head decapitating – good old classic American adventure. Meanwhile, season two takes a closer look at some of Old Town’s other residents. Ride along with Sheriff as he tracks down a group of escaped serial killers. Hang out with the Deer Hunters on their hunt for an elusive rare deer, or sit back and enjoy some Astronaut Dolphin Detective, the show within the show. Don’t forget about the wonderful Mr. Pickles who is never too far away from the action. This lovable and friendly dog still finds time to brutalize, hump and murder his victims, all in between spending time with his best friend and companion, Tommy Goodman. Mr. Pickles, a HotHouse production, is created and executive produced by Will Carsola and Dave Stewart and executive produced by Michael Rizzo. Watch Adult Swim’s preview for Mr. Pickles season two premiere. What do you think? 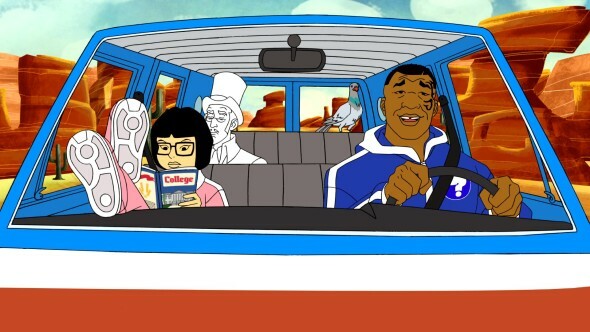 Did you watch the first half of season two, of Mike Tyson Mysteries TV show? 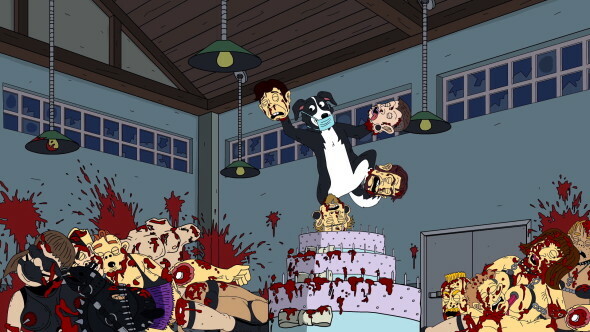 Do you plan to tune in for the second season premiere of Adult Swim’s Mr. Pickles? Tell us. More about: Adult Swim TV shows: canceled or renewed?, Mike Tyson Mysteries, Mike Tyson Mysteries: canceled or renewed?, Mr. Pickles, Mr. Pickles: canceled or renewed?